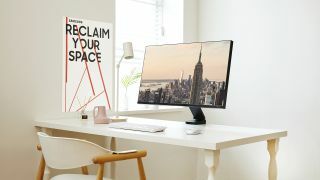 Samsung has ‘unboxed’ a trio of monitors ahead of CES 2019, and while we’d normally gravitate to the screens featuring the highest resolutions and ridiculous screen sizes, we’re most interested in the company’s latest Space Monitor. The new monitor seems like an average 27-inch QHD monitor (also available in 32-inch 4K models) but it’s also bolted onto a fully-integrated monitor arm that clamps onto your desk. Unlike traditional monitor arms, though, this one is more like a flat post that folds down in sections to allow you to adjust the monitor’s height and tilt. We briefly tested this ourselves, and while there are some articulation limitations with this type of arm, it’s a uniquely clean and minimalistic setup that should attract users looking to save desk space. The second monitor that offers something new is the 49-inch CRG9, a follow-up to the brand’s previous ultra-wide CHG90 QLED Gaming Monitor, and one that now features an even sharper dual QHD resolution. Where the CHG90 ran with a 3,840 x 1,080 resolution, the CRG9 ups the ante to 5,120 x 1,440. This practically gives you the screen real estate of two QHD monitors fused together. On top of the increase in resolution, this 32:9 ultra, ultra-wide monitor features a 120Hz refresh rate, 1,000 nit peak brightness, HDR10 support, FreeSync 2 HDR technology and 1,800 R curvature that will engulf you when sitting in front of it. Lastly Samsung has introduced a 32-inch, curved 4K UR59C monitor designed for content creators. The 3,840 x 2,160 screen features a 2,500:1 contrast ratio, support for up to one billion colors and a more moderately-enveloping 1500R curvature. The 32-inch Samsung Space Monitor is available now for $499 (about £390, AU$690). The 27-inch Space Monitor and the UR59C should also be available now for pre-order through Best Buy, Amazon and its own retail site. However, we’ve yet to see product pages go up for these displays. Samsung also hasn’t revealed pricing or a launch date for the 49-inch CRG9, but we can expect to hear more about it going into next week and CES 2019. Lastly, Samsung confirmed with TechRadar that all three monitors will be available in Australia, though pricing and availability will be revealed closer to launch.